It has been incredibly warm along the east coast of the US until just a few days ago. My birthday is in mid-December and I spent part of that day outside collecting insects in the pond with a group of high schoolers who are doing a research project with me. We had been worried it was going to be very cold, but it was a gorgeous 75 degrees! And, I saw DRAGONFLIES on my birthday. Not just one dragonfly, either. No, I saw more than one individual and TWO species! That’s never happened before, so I was thrilled beyond belief. Thank you El Niño! 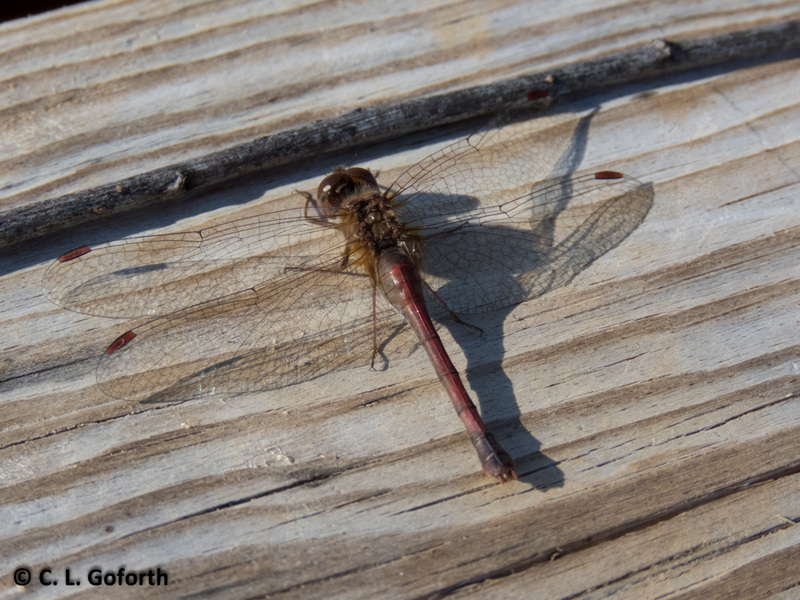 That’s an autumn meadowhawk (Sympetrum vicinum), a dragonfly species that flies at the very tail end of the season. If someone told me they’d seen a dragonfly in December, this is the one I’d think they saw because they fly later than most other dragonflies in the US. Though they’re not commonly reported so late, people do occasionally see them in December, even January in some years. I saw dozens of them throughout November and up until the 18th of December. There were so many out this year! This particular species is not as inclined to spend all their time around the water as other species, preferring to perch away from the shore. I did see a few fly out over the water briefly while I watched, but most were sitting on the platforms or the ground. Not surprisingly, they were all sitting in the full sun and with their bodies positioned so that they could soak up as much sun as possible. While it was very warm on my birthday and a few other days on either side, there were some cooler days mixed in too. The autumn meadowhawks were flying even on those days, but tended to make short flights from a warm sunny patch to another warm sunny patch rather than taking longer flights. They also let me get really close before they flew away. They apparently didn’t want to fly more than necessary on the chilly days. 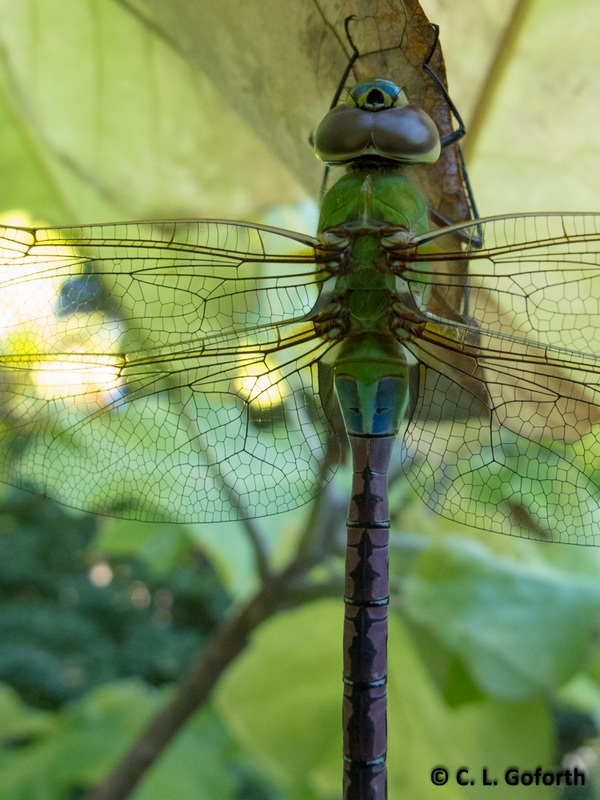 North Carolina is certainly not the only place that has been seeing dragonflies far later in the year than normal this year. I’ve heard reports and seen photos of autumn meadowhawks from places like Massachusetts and Maryland from December and a few from Canada in late November. The warm weather seems to be prolonging their season so that people all up and down the east coast have made unusual spottings. For this dragonfly lover, it makes me happy to see dragonflies so late in the year. And, it’s only 4 months until the dragonflies start to come back in the spring in my area. That’s not too bad of a wait. Not too bad at all. Happy birthday, mine was on December 17. The late sightings happened in my part of Australia last season too. 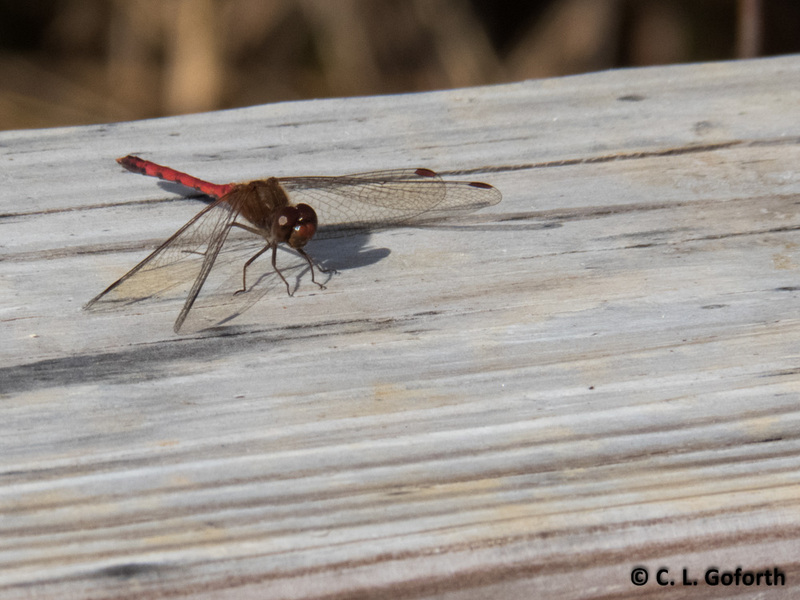 I was seeing very ragged looking Australian Emeralds and Fiery Skimmers up to the end of the second week of June, I’ve never seen any dragonfly past mid-April before that. Interesting! Were people blaming El Nino for that like they are in the US? No, it was about three months before El Nino so we were in a transition period. The difference seems to have been a strong stream of hot moist air coming across the continent from the Indian Ocean keeping temps up, but not excessively.We usually don’t get that influence on the east coast outside the summer months when it accounts for the 40-45C days. El Nino/La Nina is really a thing on this side of the Pacific, it make huge differences to our weather pattern, our droughts are usually El Nino events, but we have the strongest one in years now and have had rain almost continually since Christmas. It might be too cold, but what can you do? Sometimes that’s just the way nature works. Strange that you have them so very late though. What a great way to spend your birthday! Thanks for the information on autumn meadowhawks.